Parrot's Beak. An extraordinary round shrub with pendant branches, large long leaves and exotic flowers comprised of yellow blossoms which emerge at the end of a tube-like structure of overlapping bracts. 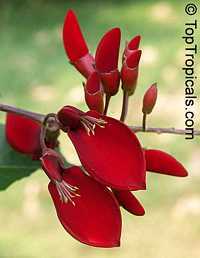 The flower resembles parrot's beak. 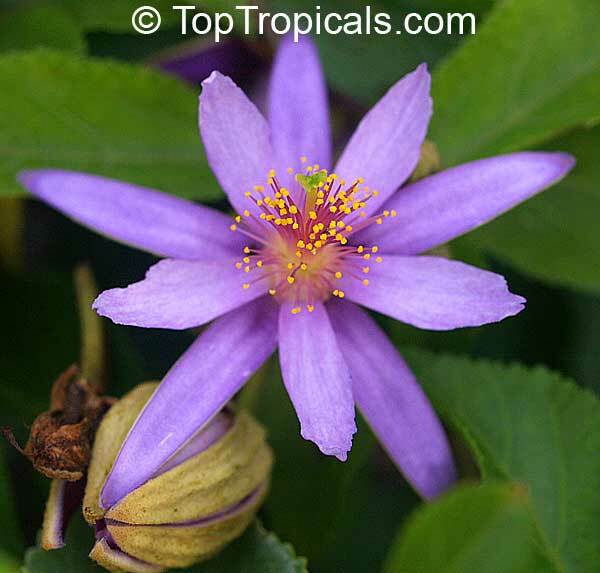 Caricature Plant - unusual shrub having purple or red tubular flowers and leaf markings resembling the profile of a human face or caricature. 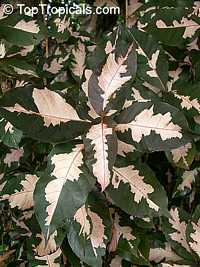 Foliage is oval shaped, glossy, variegated and leathery; useful for height in the back of a planting bed or as a specimen. 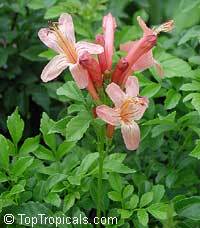 Requires consistently moist soil; do not let dry out between waterings. 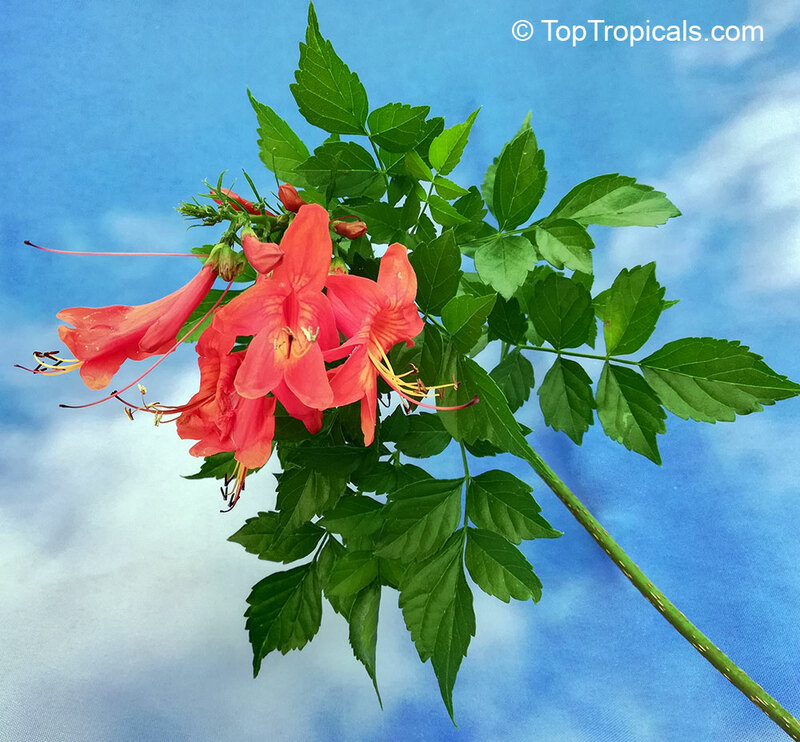 Jamaica Tea flower (Karkade, Roselle) - "Agua de Flor de Jamaica", also called agua de Jamaica and rosa de Jamaica, is popular in Jamaica, Mexico, Central America, and parts of South America and the Caribbean. 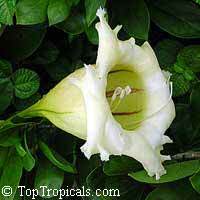 It is one of beverages made from fresh juices or extracts. 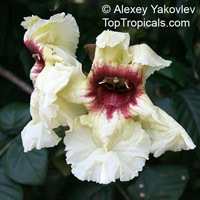 It is served chilled, and in Jamaica this drink is a tradition on Christmas, served with fruit cake or potato pudding. 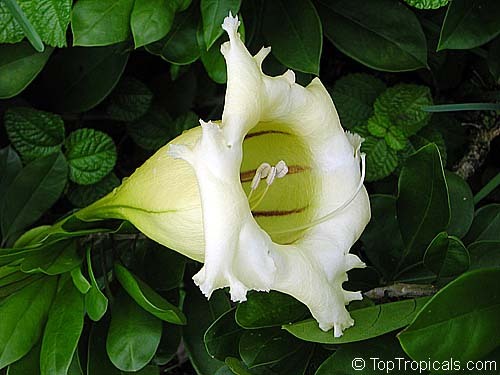 In Panama both the flowers and the drink are called saril (a derivative of the Jamaican word sorrel). In the United States, hibiscus tea was popularized as "Red Zinger". 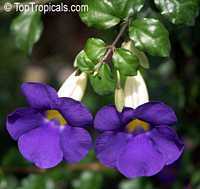 Flowers are used to make a cold or hot tea sweetened with sugar. There has been some Medical studies which indicate that it lowers high blood pressure and also has diuretic effects. The flavor is on the tart side similar to a cranberry juice. In Mexico, it is also used for granites, ice pops and sangria. Helicopter Flower. 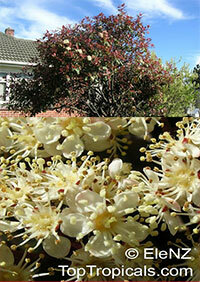 A woody climbing shrub with clusters of pink to white and yellow fragrant flowers and 3-winged, helicopter-like fruits. 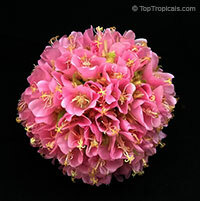 Flowers have very interesting shape and look like a decorative accessory, with fluffy-toothed edges. The fragrance is very strong and pleasant, resembles fruity perfume. Used medicinally in India. Blooms profusely from January through March! 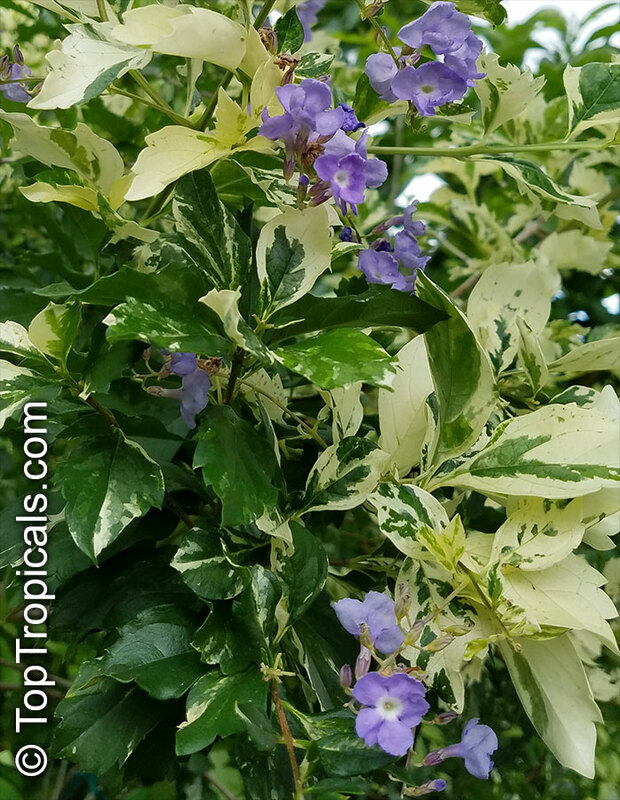 Attractive small ornamental tree with lush foliage and funnel-shaped fleshy flowers that are fragrant, with rusty purple veins. Var. 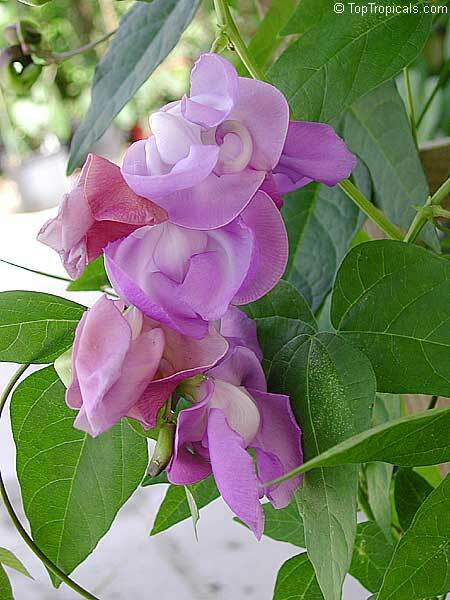 pierrii has reddish flowers. Young shoots of the plant are eaten and flowers used as a fresh vegetable. Fruits and flowers are boiled or steamed before they are eaten. Swiss cheese plant. 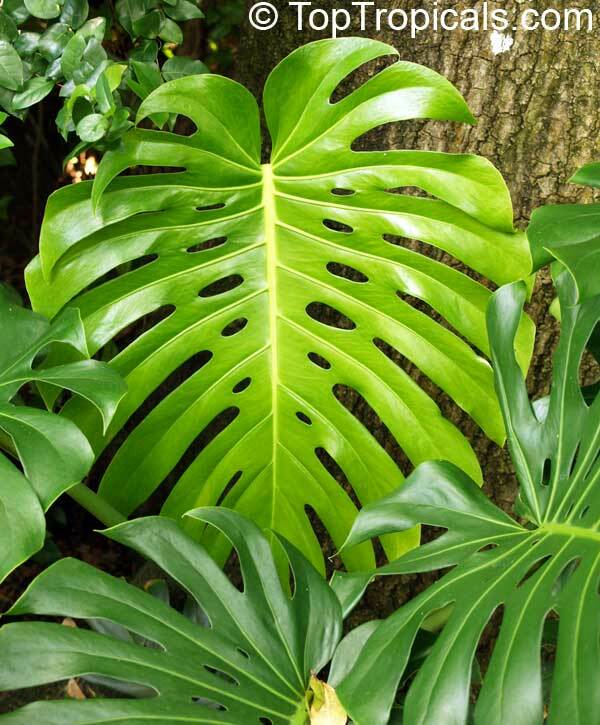 A jungle climbing relative of the philodendron from Mexico and Guatemala. 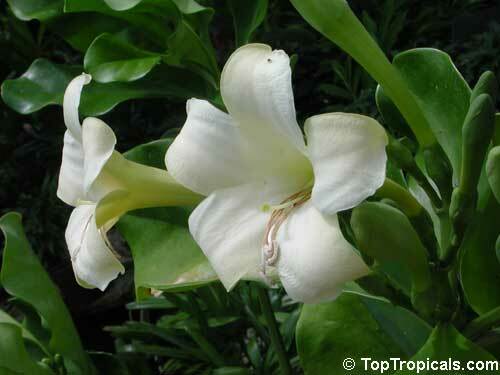 It is seen in gardens in tropical and subtropical areas, growing well in partial sun or shade. 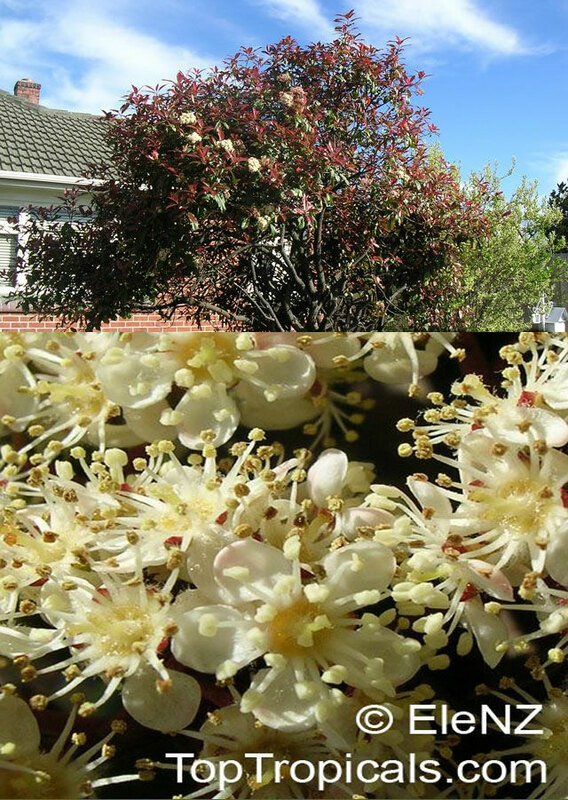 The plant begins bearing after three years. 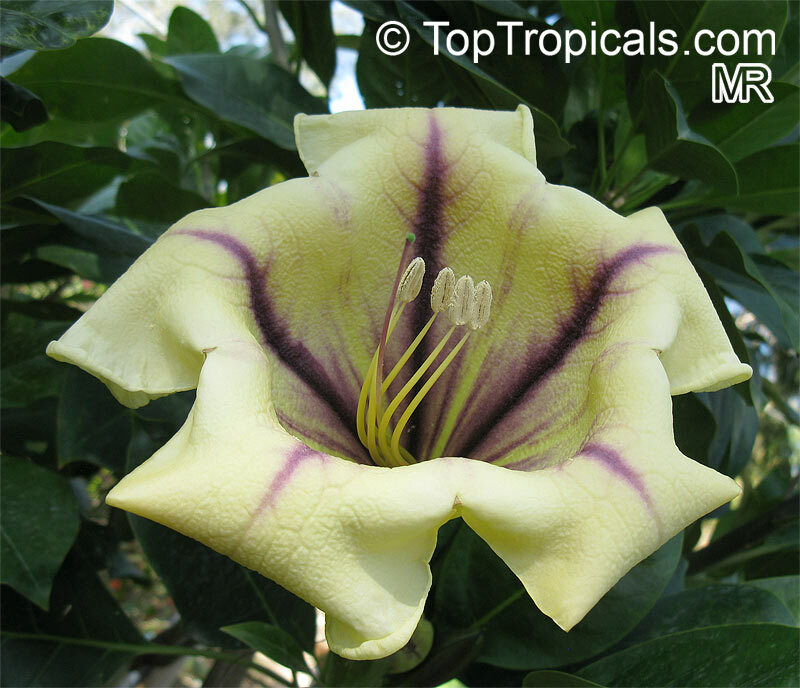 The large deep green, cone-like fruit is actually an unripened flower spike, covered with hexagonal scales that dry out and separate as the fruit ripens from the base upwards, revealing the white pulp. 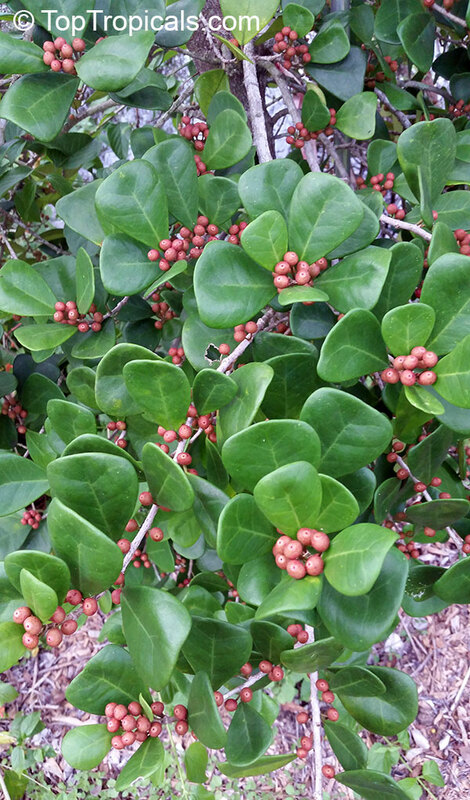 It takes a little longer than a year to mature to an edible stage. 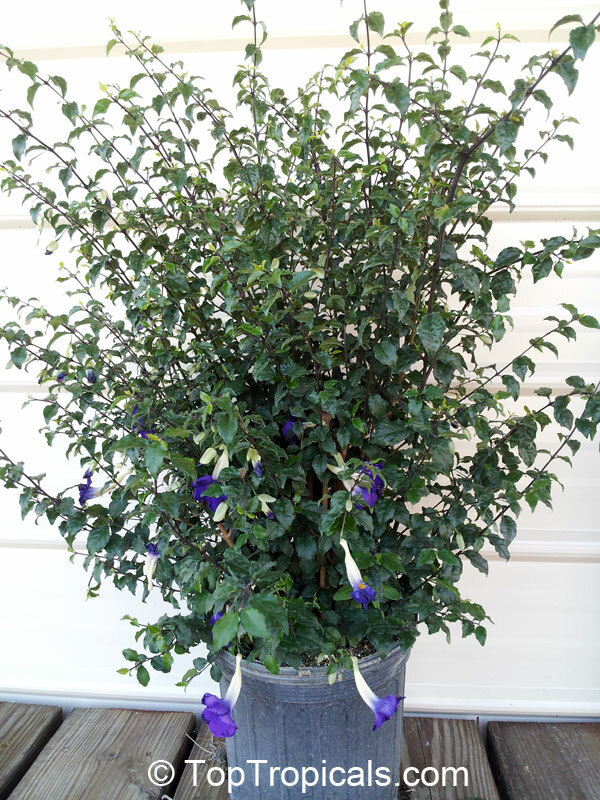 With jet black culms and feathery green leaves, this is perhaps our most sought after bamboo. 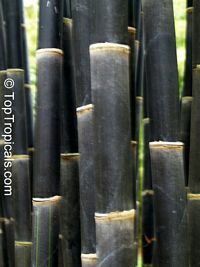 New culms emerge green every spring and gradually turn black in one to three years. 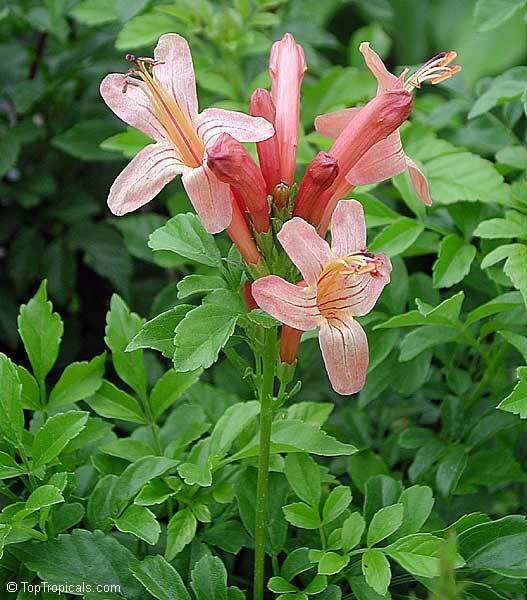 There is always a contrast of light and dark culms balanced by slender, dark green leaves. 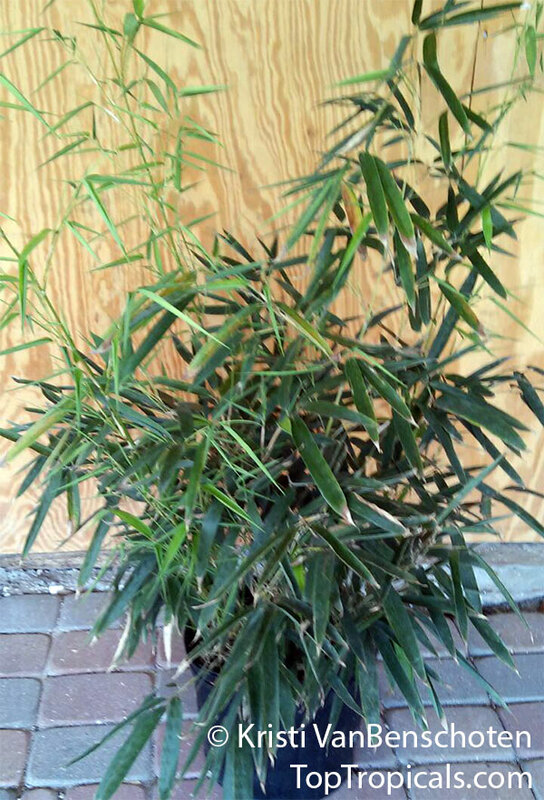 This bamboo is initially slow to spread, through when mature, it can be quite vigorous. 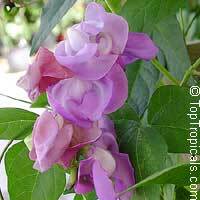 P. nigra should be given a generous layer of rich topsoil, composed of compost or aged manure and mulch, and space to grow unimpeded. It makes an outstanding specimen, if well cared for, and can be the focal point of any garden. It can also be shaped to form a dense hedge for privacy. 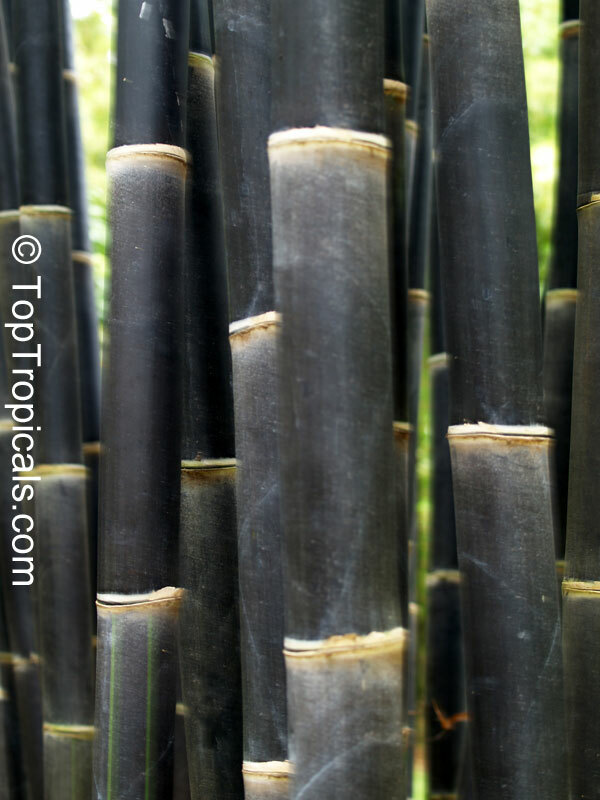 Black Bamboo and P. nigra 'Bory' are among the most prized bamboos for decorative wood working. Both will retain their dark or mottled colors when dried. USDA Zone recommended 7 through 10. 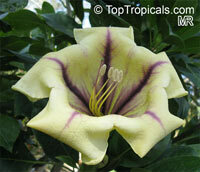 Cup of Gold Vine, Chalice Vine - very fast-growing vigorous vine or shrub with fragrant flowers and large leathery leaves. 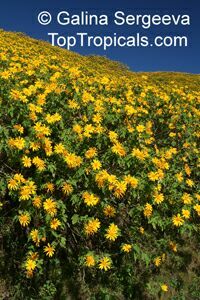 Apricot Tecoma, Cape Honeysuckle. Rare variety of tecomaria with apricot color flowers. This plant stays compact unlike other tecomarias that may become leggy. Usually kept clipped, it is often used as a low hedge. 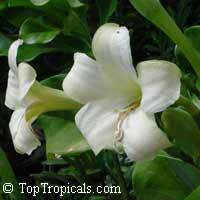 It has attractive, light green foliage and frequent displays of long, tubular flowers that may be apricot or orange at the ends of the stems. 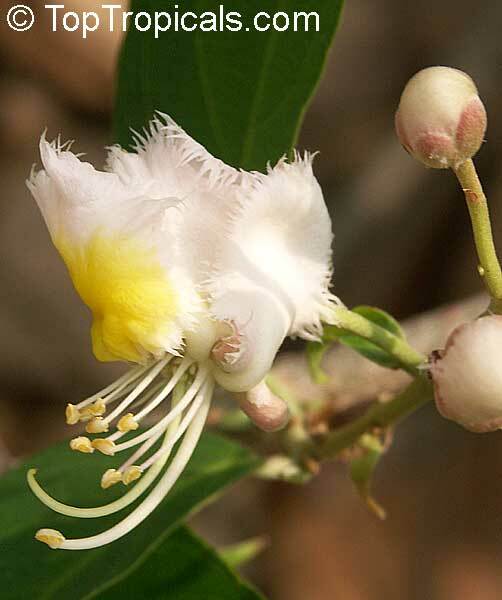 Cape Honeysuckle needs very well-drained soil and prefers full sun, but will bloom in filtered light; flowering is best is slightly cooler climates. 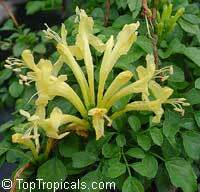 Yellow Cape Honeysuckle. 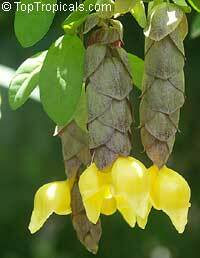 Attractive, dark green foliage and frequent displays of long, yellow tubular flowers at the ends of the stems. 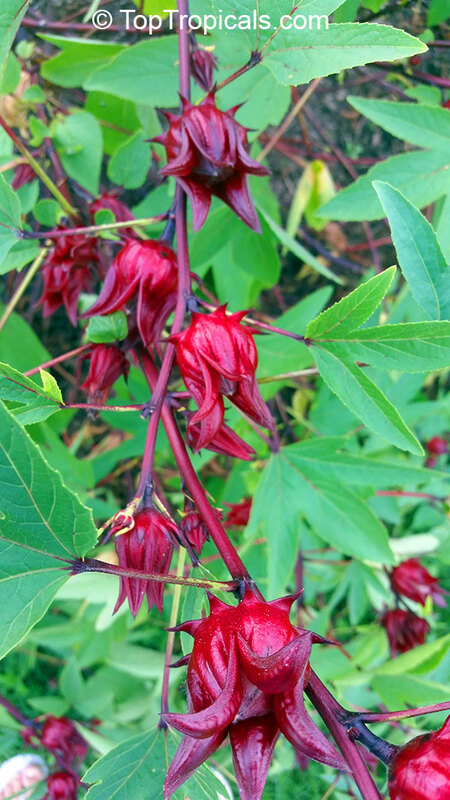 This is a sprawling plant that, if left unpinned, puts out long stems and becomes almost a vine that needs some kind of support. Usually kept clipped, it is often used as a low hedge. Cape Honeysuckle needs very well-drained soil and prefers full sun, but will bloom in filtered light; flowering is best is slightly cooler climates. 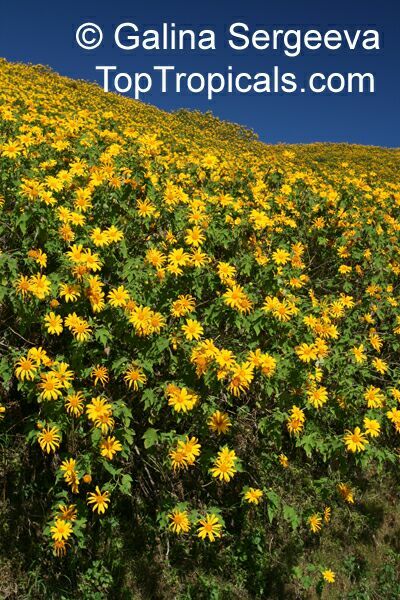 Sunflower tree, tree marigold - very fast growing shrub or small tree with marigold-like flowers 2-3" size.